Will the Bitfenix Survivor become the enthusiast's case of choice? BitFenix hasn't been around long – just over six months, in fact – but in that time has already managed to cause a stir with its first product, the mighty Colossus. Now it's released a second case, the smaller but equally well-formed Survivor. It comes in two versions: the lesser-featured Survivor Core and the case were looking at, the Survivor. The Colossus, as the name might suggest, was a full-on, full-tower case. The Survivor, on the other hand, is a midi tower, but one packed with the interesting design features that have quickly become synonymous with BitFenix. With its ruggedised finish and pop-up handle in the top, BitFenix has one eye firmly on the LAN party goers with the Survivor, but it's no lightweight, tipping the scales at 9kg when empty. BitFenix's Survivor certainly looks the part, with its matt black steel panels matched by the curved SoftTouch protection panels on the front and rear of the case. The internal structure also has a black finish, and the whole thing screams of high attention to build quality. 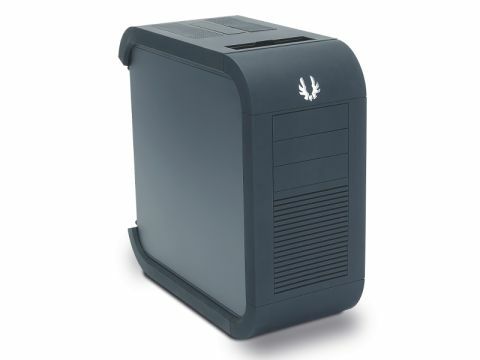 The case comes with two 200mm BitFenix Spectre cooling fans already fitted; one in the top and one in front of the hard drive cage in the front of the case. These fans are lit by red LEDs, but if you get fed up with the glow, there's an on/off switch built into the I/O panel. This panel sits under a sliding door in the top of the case and contains two USB 3.0 and two USB 2.0 ports, two audio ports and an eSATA port. So far so good, but one bone of contention for people buying the Survivor will be how you get into it. On first glance, it looks easy. Just undo the two thumbscrews and away you go. Nice idea, but unfortunately BitFenix wants to make you work a bit, so you have to get a screwdriver and undo the two small but deeply buried screws in each of the corner brackets, and take the whole bracket assembly off because they're made in one piece – if they were made in two pieces, it would be much friendlier. People who build their system and forget about them won't care about this, but it's annoying if you like to upgrade PC components on a regular basis. As with the Colossus, the Survivor looks the business straight out of the box. The curved protection on the front and rear of the case is a nice touch, and the attention to detail in everything from the choice of ports in the top I/O panel to the drive bays that can be used for either conventional 3.5-inch drives or 2.5-inch SSDs is first rate. The only really annoying thing about the Survivor is how you get into the thing. Having to take off both parts of the rear curved protection is frustrating.